A formerly dark, poorly ventilated caviar warehouse is illuminated naturally thanks to a sunken courtyard with a retractible glass roof, connecting the interior spaces to an outdoor terrace, acting as both a space and a sort of floating lantern in the unit. 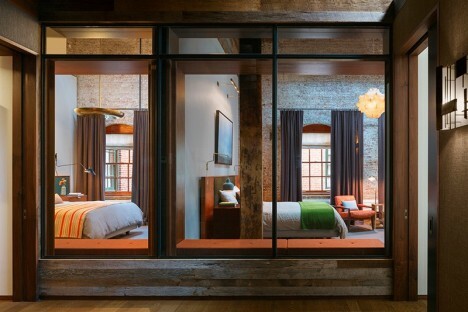 Many of the historic details of the 1884 building in Manhattan’s Tribeca North have been preserved in the renovation, including weathered roof joists, antique windows and brick walls. 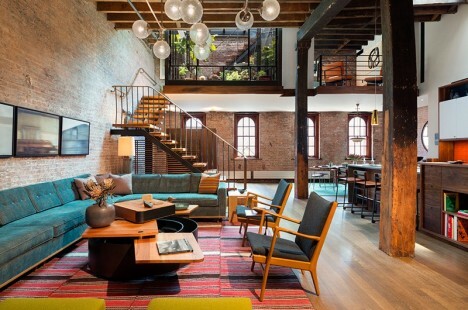 The converted loft by architect Andrew Franz occupies the top floor and roof of the old industrial building, reusing as many of the original materials as possible. 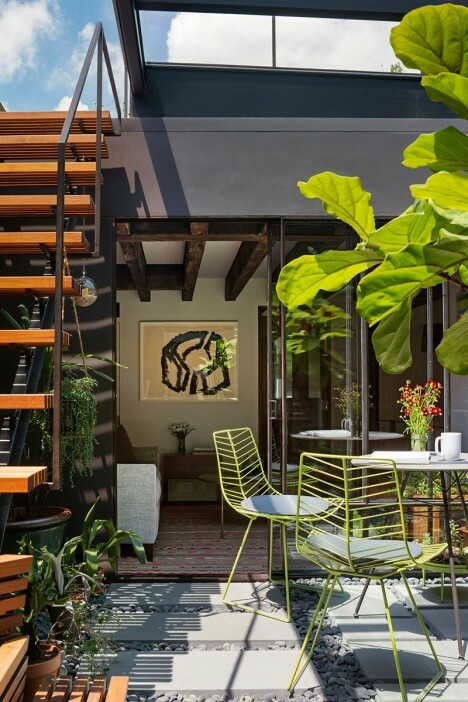 The glass courtyard functions as a mid-level in the open-plan space, with a new staircase with reclaimed walnut roof joists as the treads and landing leading up to the transparent indoor/outdoor room. 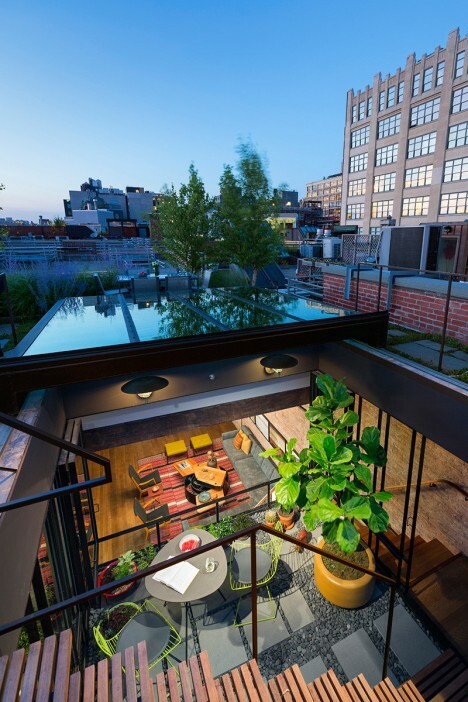 When the retractible roof is open, fresh air flows freely into the living space. 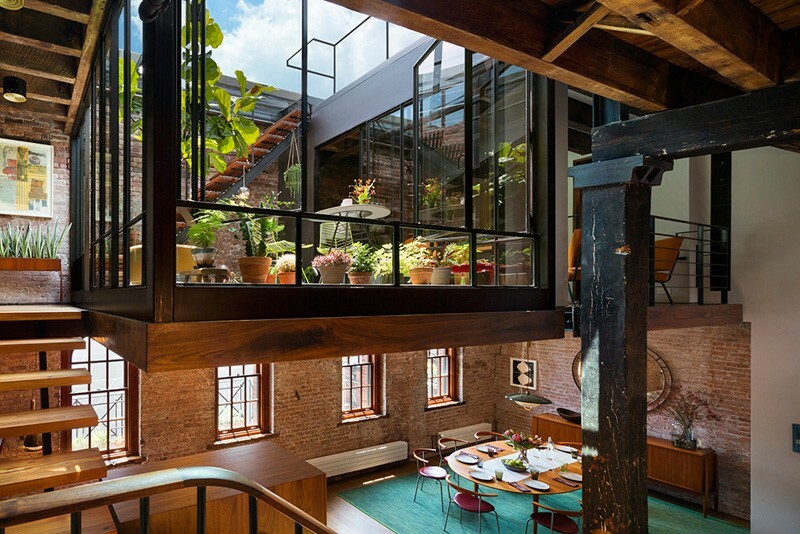 When closed, it functions as a 150-square-foot skylight during the day. 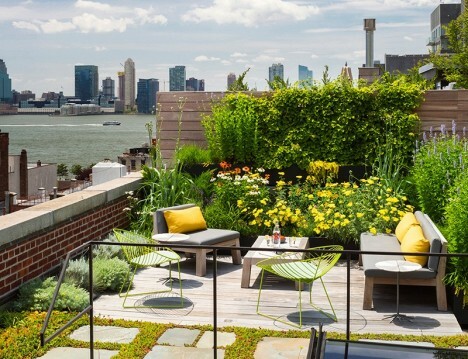 An additional staircase provides access to a rooftop garden planted with native, low-water plant species. 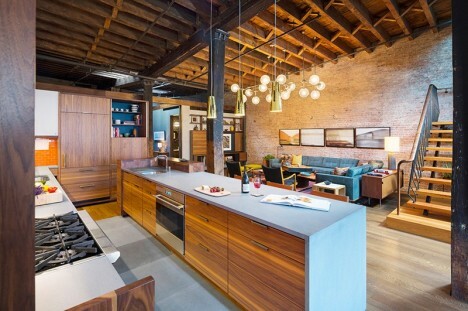 New walnut cabinetry connects the modern elements of the loft to the historic, highlighting the building’s industrial past and simultaneously creating a space that feels warm and comfortable. Vivid orange in the kitchen backsplash and furniture add pops of color throughout the mostly-neutral space.